Thomas Jefferson once said, "the harder I work, the luckier I get." 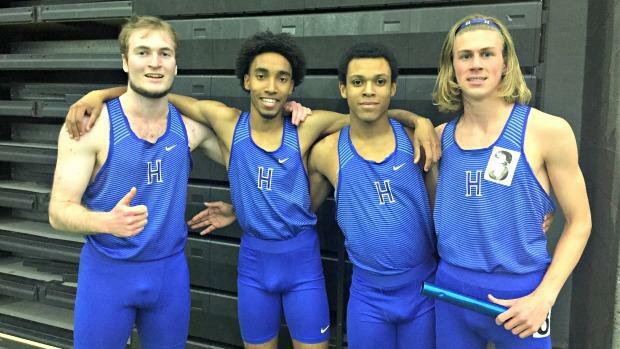 Hall High School boys team won the CIAC Class L title with many points that were not expected to score. According to Hall assistant coach Jeff Billings, "we scored 28 points from guys that were not seeded in the top eight of their event." He added "we knew we would get big points from Miller (Anderson) and Trey (Cormier)... but it was the rest of the team that won it for us. While Hall really stepped up their game, unfortunately host Middletown High had some unfortunate events. First of all, their top seeded 4 x 100m dropped the baton and Garrett Dandridge, who was one of the top seeds in the 100, 200m and 400m did not finish the 100m due to injury which kept him out of his other events as well. In the girls meet, Windsor sprinted past their competition like a cheetah. While they only scored three point in the field events, the Warriors certainly did shine on the track. The took the top spots in both sprint relays and a 3rd in the 4 x 800m. But where they really earned the title was by sweeping the top three spots in the 100m, the top two places in the 200m and a first and third in the 400m. The following performances have qualified for New Balance Outdoor Nationals, June 15-17, 2018 in Greensboro, N.C. Broke Sarah Mattison of Simsbury's Class L record of 10:45.92 set in 2014.